Equip: Steel ribbed corset (armor as studded leather), Poisoned scimitar 1D8 + (1D6/per lvl on 1st hit), 8 poisoned hairpin darts 1D4+(1D6 per/lvl). Dried and liquid Scorp-man venom. 24GP. callous, a practiced murderess. Thinking of becoming a better person, but not trying very hard. Nell is a human assassin who has fled the Certopsian Plains because she is known as a callous, practiced killer there, but more because the local organized criminal elements want her dead badly, and badly dead. There is a $1,500.00 bounty on for her severed head and wanted posters in most larger Certopsian communities. She is being hunted because after several years of service as an enforcer at an organized crime funded brothel she tired of her job, and took offense to something someone said (she doesn't even remember who or what). As redress to this offense calculatedly she murdered her boss, the madam, and three wealthy patrons. She fled to Denethix after looting and setting fire to the brothel. Nell will not reveal this past unless forced to. 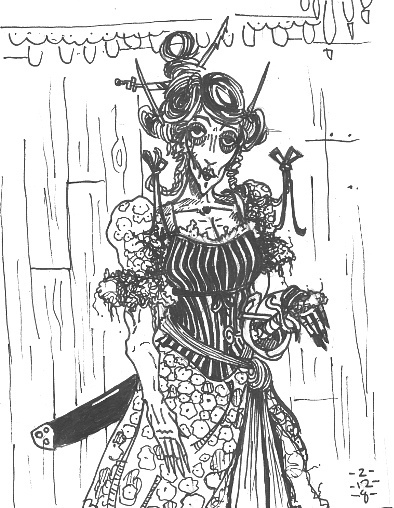 Nell appears to be a prototypical Certopsian woman in her mid 20's (she is 26), clad in dusty, weathered, but fairly high quality, saloon garb. At home Nell would not be notable and might even be mistaken for a member of the Certopsian upper classes (a rancher's doxie or successful bar singer perhaps), but in Denethix she seems odd and rustic. Nell isn't especially noteworthy otherwise, she's 5' 7” and about 110lbs, with ashy blond hair, large gray eyes and a pointed face. However; even a casual observer will notice her sinewy, rock hard musculature, and unwholesome thin build. She has an unsettling presence, moving with uncanny speed and grace. Despite these oddities, and the old knife scar running down the right side of her face and curling her right lip, she is a pleasant and gregarious woman who's normal demeanor only occasionally slips to reveal she views most people as prey. Nell speaks with an obvious plain's lilt and is fond of citrus and Certopsian beetle liquor.